A vintage with serious identity, 2017 continues a fascinating trio following 2015 and 2016. But which are the wines to buy? This is not only a vintage of incredible variation in quality from Château to Château, but it is also a year when you cannot just simply order by name or reputation. It is, in fact, a wine writer’s vintage, because it requires forensic assessment as well as complete transparency and honesty. 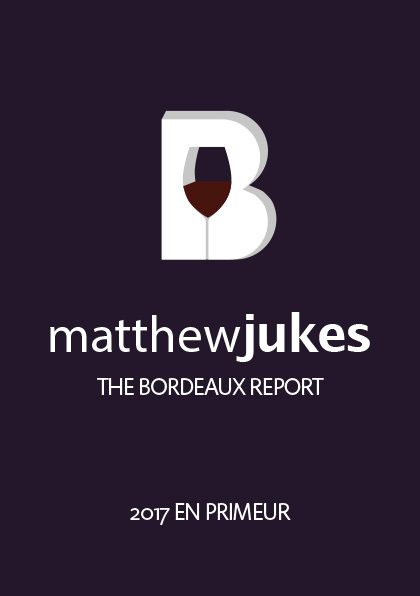 My Report covers the extraordinary and unique weather conditions which gave rise to these remarkable wines, with 333 notes and scores on the most important dry white, sweet white and red wines in Bordeaux. This is a 100% independent view on the 2017 vintage and it will enable you to make highly informed decisions on which wines to buy for your cellar. As early prices emerge, we may well be able to afford a few cases, too. It is a great report and your introduction is spot on. I look closely at Matthew Jukes’ tasting notes: he is a great art critic, with a personality that cannot be influenced. It is always a pleasure to see Matthieu Jukes every year. We find his kind comments full and clear. Matthew is a true wine lover who goes directly to the properties for a deep understanding of the weather, terroir and winemaker. His reports are detailed, fair and concise. Very detailed and gives great insight to your readers. Your comments are really precise.